Michael Woolfson is awarded the sixth Ewald Prize at the Opening Ceremony of the IUCr Congress in Geneva. In 2002 it was announced that the sixth Ewald Prize had been awarded to Professor Michael M. Woolfson (Physics Department, University of York, York, UK) for his exceptional contributions in developing the conceptual and theoretical framework of direct methods along with the algorithm design and computer programs for automatic solutions that changed the face of structural science and for his contributions to crystallographic education and international collaboration, which have strengthened the intellectual development of crystallographers worldwide. 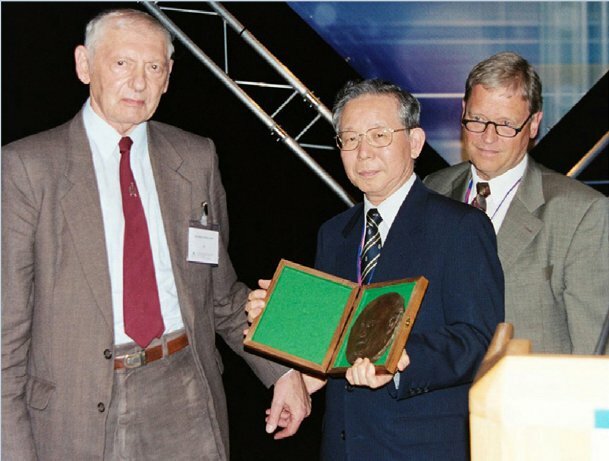 The presentation of the Ewald Prize was made during the Geneva Congress Opening Ceremony in August 2002. For a list of papers by Professor Woolfson appearing in IUCr journals click here.